Still looking for some guilt free eating after the holidays? Look no further. 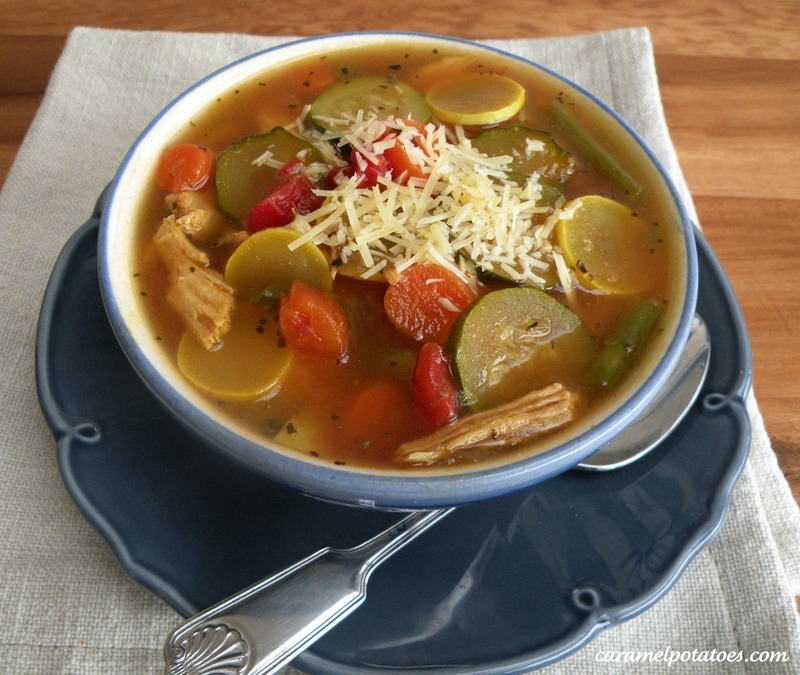 This soup is so good – wonderful Italian flavor loaded with lots of vegetables and a little chicken- it’s completely healthy! How often to you find something yummy that you can eat all you want? Make up a big pot of soup for dinner, then heat up the leftovers for lunch all week long. Perfect! 1. Heat olive oil in a large pot. Add onions and cook for about five minutes (until onions start to get tender). Add garlic and saute for another minute. Add chicken stock, basil, oregano, carrots and green beans. Cook covered on medium heat for about 30-45 minutes, or until chicken will shred. 2. Shred chicken and add tomatoes, zucchini, and squash. Continue to cook uncovered for another 15-20 minutes (until squash and zucchini are tender). 3. Add fresh ground pepper to taste and top each serving with grated parmesan cheese. Note: The chicken is very subjective – add as much or as little as you like. If they are large, I just add one chicken breast. Same with the veggies – just add lots of your favorites! Enter our Cinemark Movie Pass Giveaway Here!